"We had great communication and service from Planet J and would recommend them to any others who might be thinking of going online with their website and/or products." 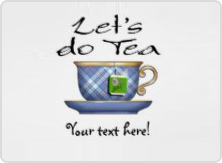 Let's Do Tea of Denton, TX brings good quality tea and tea related products to the home through a nationwide network of over 200 consultants. To place orders, customers had to find a local consultant who would then place an order to headquarters. This was done primarily through phone and fax. Clearly, Let's Do Tea needed a modern solution to streamline this process. 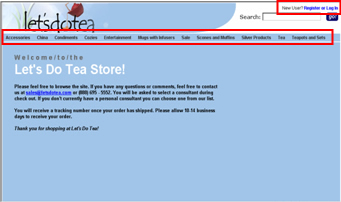 Meredith Tieszen, owner of Let's Do Tea, was seeking a solution for her consultants to order merchandise over the web. Orders were being taken over the telephone or fax with time consuming overhead and paperwork. This solution would also need to scale well with her rapidly expanding consultant network. Tieszen requested that all applications be created with the same look and feel of the existing company website. 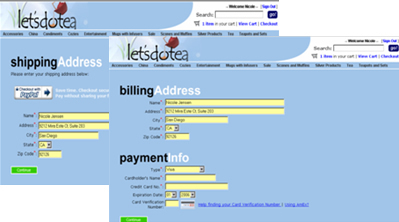 PlanetJ worked with Let's Do Tea staff on an e-commerce solution that allows consultants and customers to pay for orders with a credit card using PayPal™ payment services. WOW (Web Object Wizard) software was used as the framework of the project to access data from a MySQL database. 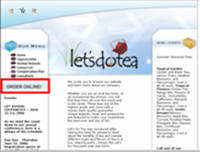 The applications were linked directly with a URL to the existing Let's Do Tea website and customized by PlanetJ developers to have look and feel desired. In addition to the goal of consultant order and consultant lookup, Let's Do Tea required that their applications would be flexible enough to handle steady company growth. Requirements included features like: The ability to link from the current site and open a new browser window allowing shopping or product browsing; product searches based on multiple fields; products shown in a tabular view along with images; drill down to item details; add to and edit cart, continue shopping, or proceed to checkout with each step; and store order information in MySQL database pending approval. The application also needed checkout process flow control, a screen for shipping/billing/payment information entry, and the ability to accept credit cards and issue an order confirmation. 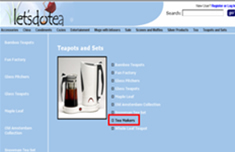 In addition there needed to be an Administration application that allowed any Let's Do Tea staff member without any technical knowledge to add, manage and delete information. 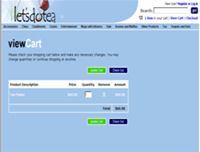 From the Let's Do Tea home page, a consultant or customer can access the shopping application through the "Order Online!" button on the left side of the page. New users can either log in here or at checkout. 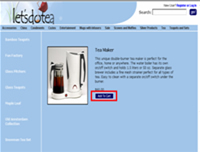 They can then shop using the various menu items in the horizontal navigation bar (teas, accessories, sale items, etc.) or by using the search box in the upper right hand corner. While shopping, the user may hover over the various menu items and images will be shown. Selecting the item in the menu will bring up details/cost. The user then has the option to add the item to the shopping cart. If an item is added to the shopping cart, the user will be directed to the View Cart page. From here they can easily remove items, change item quantities, check out, or continue shopping. 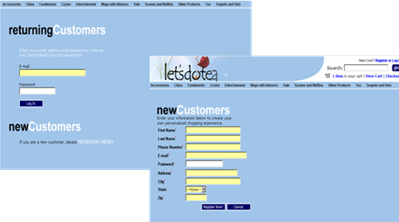 Returning customers can then log on or new customers can create an account. Once signed on, a user can choose a consultant to work through. Typical of most web based ordering systems, the user may then verify shipping and billing address and proceed to enter in payment information. The entered information is then processed and verified by PayPal™. Let's Do Tea enlisted the help of WOW Enterprise 6.4 to build their online e-commerce site, shortening development time significantly over any other custom web application solution. The consultants and customers now have convenient access to ordering 24 x 7 via the internet and payment is handled securely through PayPal™ and Verisign™.